What might it mean for humanity to live well, together? How might such an existence be realised? In conventional development theory and practice, whether wellbeing is viewed in functional-material (“standard of living”) terms or takes into account experienced life quality (“quality of life”), the conditions for wellbeing are considered in almost exclusively economic terms. Wellbeing, in whatever way this is conceived, therefore tends to be associated by default with the globally dominant consumer-industrial form of economic organisation. Increasing wellbeing supposes expansion of this. Consider, for instance, the United Nations Development Programme’s Human Development Index. Each of the index’s components–life expectancy, literacy, school enrollment and income–is either directly economic in nature, or is dependent on economic factors for its improvement. Want improved health? Increase expenditure on medical infrastructure and services that reduce mortality. Want improved education? Build more schools and employ more teachers. This is obviously a very rough caricature. I ignore myriad nuances here, particularly at the micro scale. But in terms of headline initiatives attracting the majority of resources, I suspect few would argue that the generalisation is entirely unreasonable. And this is where Beyond this Brief Anomaly‘s energy focus intersects with the broader interests outlined above. As I’ve argued throughout the inquiry, to understand economic systems comprehensively, it is not sufficient to think about them in financial or monetary terms. We need to give careful attention to physical economics, or how it is that economic systems do what they do, and the conditions on which they depend for this, in physical terms. At the highest level of abstraction, economic systems can be conceived in terms of the acquisition, transformation and distribution of materials to serve human purposes. 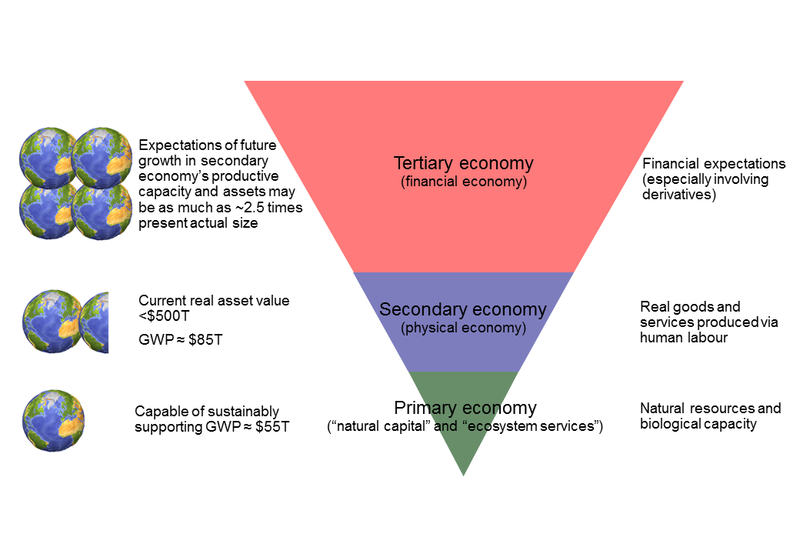 The forms that economies take–the materials they acquire, the nature of the transformations they carry out, and pattern and extent of distribution (and the rate at which each of these high-level functions proceeds)–are both enabled and limited by the primary energy sources and associated means of conversion available to human societies. In this sense, energy considerations are fundamental to understanding human societies and the economic options available to them in pursuit of wellbeing. Under circumstances in which the levels of material consumption and energy use associated with current rich-world economic conditions are curtailed, what are the implications for human wellbeing and the pathways for its realisation? Adequately investigating both of these questions requires close attention to what it is that we mean in the first place by wellbeing. It shouldn’t be assumed that the definitions, measures and indices that are currently de rigeur in mainstream development circles are necessarily adequate here–as critical thinkers on development issues such as Richard Eckersley have been at pains to point out for some decades now. The relevance of the second question depends, of course, on accepting that curtailed material consumption and energy use lies within the field of plausible human futures. Exploring key factors relating to this has been the central focus of Beyond this Brief Anomaly to date. I’ve attempted to establish the foundations for a critical energy literacy suitable for forming an informed view on this. There’s scope for going considerably further in this direction–but as I pointed out very early on, the only knowledge pathway that will provide the certainty demanded by the most hardened sceptics–of any disposition–is the global action research project in which humanity is currently immersed. “Ultimate answers”, to the extent any such outcomes can be expected, require time and action rather than increased analytical rigour alone. So, over the past two and a half years, drawing together the various intertwined threads of what is now well over a decade of personal investigation, I have been working in parallel on these two questions–having personally accepted that the futures to which the second question points are indeed highly plausible, and deserve our close attention. And so I am pleased to announce to readers here the recent publication of Descent Pathways, a special issue of the journal Foresight co-guest edited with Richard Slaughter. Today, more than forty years after the Club of Rome published the Limits to Growth (Meadows et al., 1972), a renewed groundswell of awareness appears to be building in relation to humanity’s overshoot of numerous global limits. While the Limits to Growth thesis drew the ire of champions for the established economic order, evidence supporting its veracity continued to mount (Bardi, 2013, Turner, 2012, Turner, 2008). Growing appreciation for the collective socio-ecological challenges faced as we converge on planetary limits is accompanied by speculation that some sort of civilisational collapse could be immanent. Understandably enough, such concerns can readily appear over-stated and, as such, are commonly dismissed—if not ignored or neglected—by guardians of established socio-political and economic arrangements at every level. The evidence in support of such views is less easily dismissed and, over time, has arguably led to a systemic crisis of purpose that raises major questions about the very basis of the existing, growth addicted, social order. The prospect of collapse not only implies an end to three centuries of technological complexification, economic growth and wealth accumulation; it also suggests that we are entering a period of widespread disruptions and conflicts, especially in relation to constrained expansion of—and even decline in—resources of energy, food and raw materials. Hence a growing cohort of practitioners and researchers has turned attention to understanding what is at stake and how this ‘civilisational challenge’ can be addressed. Such inquiry is typified by work including that of the Transition Town and de-growth movements. We have chosen to explore this domain via the concept of ‘descent pathways’ as we believe this holds out real hope for what might be called ‘moderated descent’—as opposed to the kind of comprehensive ‘crash’ that some suggest could unravel many of humanity’s prized economic, technological, social, political and institutional gains of the industrial age. This situation clearly has major implications for all who are concerned about their children, future generations, other species, the environment and so on. It arguably has even greater significance for futures and foresight professionals as it alters—probably forever—the earlier core hope and aspiration of the field to be focused on ‘exploring alternative futures.’ While there are still plenty of alternatives that can be envisaged, it appears that they will fall increasingly within the kind of limitations that we are addressing. This creates in our view a strong imperative to generate deeper understanding of the issues before us and to stimulate a new or renewed commitment to effective action. It is towards these twin purposes that this special issue of Foresight is directed. The figure below from the introduction summarises the case for using the descent pathways metaphor as a central guide to sense-making in relation to longer term societal futures. My own contribution to the special issue, titled “Sense making and acting for descent futures: human and cultural pathways”, explores some foundational issues relevant to both lines of investigation on the relationship between human wellbeing and economic conditions. It sets out the case for elevating cultural narratives to a more prominent placed in making sense of the present human situation and possible futures, and attempts to establish some key characteristics of narratives that might support the realisation of improved wellbeing under “descent conditions” (or, indeed, otherwise). The full article is available here, and the introduction excerpted below. In the context of an inquiry into humanity’s civilisational futures, the concept of socio-political collapse understandably stirs strong emotions. The historical and archaeological records confirm significant correlation between collapse in the complexity of socio-political institutions and serious population-scale adversity. Even so, as a possible future for any human society, the general idea of collapse tends to evoke in the popular imagination associations significantly more extreme than the records of past experience warrant. In one account, it’s a magnet for end-of-civilisation apocalyptic fantasies; and in another, as the sworn enemy of civilisation’s ever onward march to futures inherently bigger, better and brighter than the present, it spells nothing less than the end of meaningful existence (Greer, 2008). Differentiating between descent and collapse is an important step in ameliorating the collective anxieties and fears attending an awakening to the prospect that industrial civilisation’s great material and technological gains might be impermanent. The descent metaphor, as discussed for instance by Greer (2008), Holmgren (2009) and Slaughter (2010), brings to bear a greater focus on the temporal dimension of collapse, shifting from a default framing as near-term and sudden catastrophic event within which lives (and lifeways) are consumed towards that of an extended age forming the context within which different identities and lifeways evolve. Of principal importance, the distinction between descent and sudden cataclysmic breakdown offers far greater scope for human agency in responding to the situation at hand. I argue that this has a vital—and vitalising—role to play in moving beyond the more dystopian assumptions that frequently attend consideration of alternatives to the dominant narrative by which the modern industrial world makes sense of its recent history, present situation and future options, the myth of progress (Gray, 2013). In the present article this temporal differentiation is the departure point for exploring a further distinction between the conditions of human societies as measured in quantitative economic terms, and prevailing assumptions about the nature and origins of human well-being. Specifically, I will challenge the characteristically modern conceit that descent in the scope and extent of human societies’ material and energetic means and socio-political complexity necessarily implies commensurate descent in individual and collective experiences of well-being. In doing so, two important qualifications bear considering. Firstly, on initial inspection the decoupling that I’m aiming for between trajectories in economic and socio-political conditions and well-being may appear to mirror more closely than intended the distinction drawn by development economists between standard of living and quality of life, as exemplified by Amartya Sen’s leading work (Sen and Hawthorn, 1987, Nussbaum et al., 1993, Stiglitz et al., 2010, Anand and Sen, 2000). The view that I present here marks a radical departure from this. Sen’s human capability perspective, for all its important nuance, remains both a product of and firmly entrenched within an industrial-world outlook, an entailment of what Roszak (1972) characterised as “single vision”. The trajectories I envisage under the guise of descent pathways are characteristically de-industrial in nature. Here descent specifically entails transformations beyond industrial organisation, and assumes decrease in the net energy conversion rate available to human societies. This entails overall reduction in the rate at which material change—transformation, production and transport—unfolds. Such a starting point demands far greater flexibility in thinking about well-being than the present industrial context affords us. Secondly, the theme of this special issue is specifically descent pathways. Coming to terms with the prospects for human well-being under conditions of descent demands that we explore beyond the question “where are we going?” to ask “by what pathways might we proceed?” Ample evidence is available for high levels of experienced well-being with far more modest economic conditions than those enjoyed by today’s rich-world citizens. At the same time, the historical record indicates clearly that past periods of descent involved widespread and often severe human costs. Populations typically decline or disperse. On many objective measures, life conditions deteriorate compared with those of the prior peak in economic throughput and socio-political complexity. My intent is not to downplay or glorify this. Rather, I wish to challenge an implicit assumption that lives lived under circumstances of descent are of lesser value than those lived today by the portion of humanity that enjoys benefits associated with the peak of industrial society’s prosperity that outweigh attendant costs. A corollary of these two qualifications is that the pathway metaphor itself demands careful re-envisaging. In contemporary societies, pathways are themselves typically regarded as products of the industrial approach to organising and constructing, where the efficacy of centralised planning and control is taken as given. But where the industrial context is itself under question, the assumed certainties on which this relies lose their instrumental power. Such conditions suggest as more efficacious a path-making approach based on the contingency-based and situation-responsive principles of action inquiry (Wadsworth, 2010, Floyd, 2012). My overall intent is to take some early steps towards achieving what to the modern mind often seems unthinkable: establishing an engaging vision of descent based on a reinvigorated view of life quality within the context of material and energetic humility. Autonomy of meaning making—foundational for participating as a matter of individual freedom and choice in the generation of collective structures that enable harmony and equality (Quilligan, 2012)—is central to the view of life quality that I have in mind as congruent with this aim. This will involve not only viewing descent in a different light, but rescuing the collapse concept itself from pathological or dystopian associations by recasting it in the more useful role of an evolutionarily adaptive response within environmental conditions unfavourable to a continued growth trajectory. For this we will also need to consider closely the relationship between popular misconceptions of what evolution in fact means for professional scientists, and the influence that such misconceptions, via their connections with the myth of progress, hold over contemporary thinking about preferred futures. This implies the difficult cultural task of unlearning established habits of thought. Two propositions guide thinking here: 1) we as a species are capable of recognising and overriding the impulse to avoid such difficulty; and 2) we are also sufficiently resilient to confront the full implications of our situation. Such views are frequently contested, even within the foresight field. I suggest that this reflects excessively narrow or cautious interpretations of the research literature on the nihilistic effects of exposure to “apocalyptic” futures images as implying that those without specialist training are not equipped to participate in such confrontation. It seems a retrograde step to extrapolate from research on the pathological effects of exposure to the most extreme images of civilisational destruction—bearing little resemblance to the archaeological and historical accounts of actual past descent processes—to the view that “everyday people” should be shielded from opportunities for coming to terms with the highly strained interrelationship between humanity and its planetary support systems. I proceed from the view that we are capable of meeting the challenge of unlearning both creatively and constructively, with enthusiasm, and further, drawing from this new sources of meaning to undergird the experience of lives well lived. Such unlearning has potential to unlock the panoply of latent cultural knowledge available to guide effective thinking about descent pathways. I will round out the article by considering two case studies from this knowledge base, and some brief implications for practical enactment of viable pathways that employ descent in an emancipatory capacity. The full article provides a fairly comprehensive summary of the territory that future posts here will explore. Floyd, Joshua, and Richard Slaughter. 2014. “Descent pathways.” Foresight 16 (6):485-495. doi: http://dx.doi.org/10.1108/FS-07-2014-0049. Floyd, Joshua. 2014. “Sense-making and acting for descent futures: human and cultural pathways.” Foresight 16(6):587-607. doi: http://dx.doi.org/10.1108/FS-11-2013-0061. This entry was posted in Societal futures and tagged Descent Pathways, economics, Richard Slaughter, sense-making, wellbeing by Josh Floyd. Bookmark the permalink.